Saga's Cottage : Just an update! 1. I like to giveaway things during the Samhain Sirens October extravaganza. If you don't know what that is please go here. The whole month of October will be filled with blogs, recipes, crafts, fun, and giveaways from all sorts of talented and wonderful vendors. 2. I'm decorating my home for Samhain. 3. I'm getting the gardens ready for winter and harvesting the last of my herbs. I thought that I would show you some things that I've painted and made these past couple of weeks. The first thing to show you is one of the giveaway items for the Samhain Sirens. This one will be offered as the very first giveaway of the season! 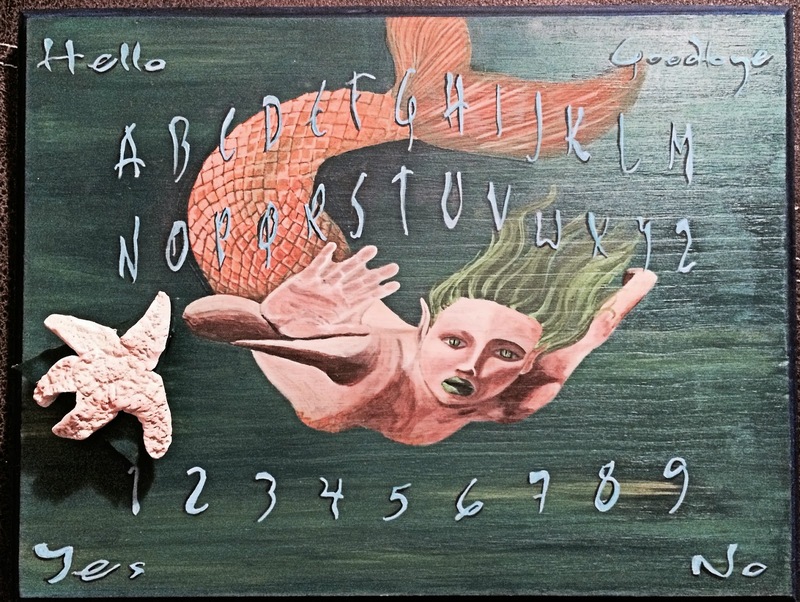 It's a handpainted Siren spirit board with a handmade starfish planchette! The planchette is very lightweight and glides easily across the board. The board has several coats of protection and is signed and numbered by me. One lucky winner will get this beauty! I'm not going to lie, I want to keep this for myself. The next thing that I made was a custom spirit board. This one was a lot of fun. 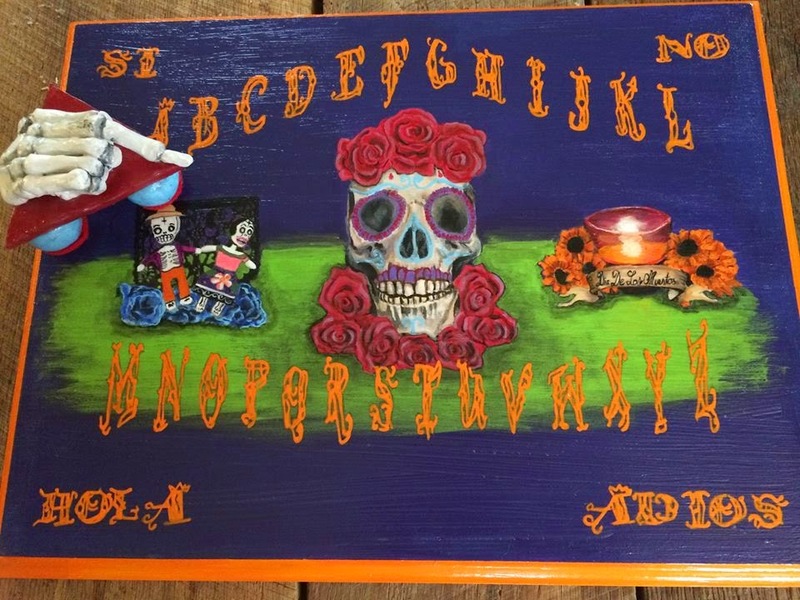 My client wanted a Day of the Dead spirit board. So many bright colors with which to work! Yes that is a skeleton hand planchette. I also just made my spirit sister a birthday present. Rita of Lapulia Studios has a life that I wanted to turn into fairy tale. So I made a story all about her and painted a picture of her to go with it. "Once upon a time there was a beautiful Witch that was generous and kind. She lived deep within an enchanted forest in a beautiful home. The Witch's most favorite thing in the world was magic. She loved seeing the results of the magic that she worked. In every aspect of her life, magic was used. It made her happy and she saw the importance of having it in the world. She loved to help people. People came from far and wide to be helped by the Witch's magic. She loved the happiness that her magic brought when she helped them. But, this also made her sad. She wanted to be able to help more people, but she could not possibly help all of the people everywhere. The Witch sat and thought of a way that she could help more people. What could she do? She wanted a way to spread the magic into the world, for she saw that it was needed. Maybe she could make a potion? Maybe a spell? But for the potion to work, everyone in the world would have to drink it, and the spell would have to contain all of the knowledge that the witch had, for it to work. A spell nor a potion would work. The Witch thought long and hard. For days she thought and thought. And finally an idea came to her! She would create beautiful magical books to share all of the knowledge that she had! The Witch was so happy to begin working on her idea! 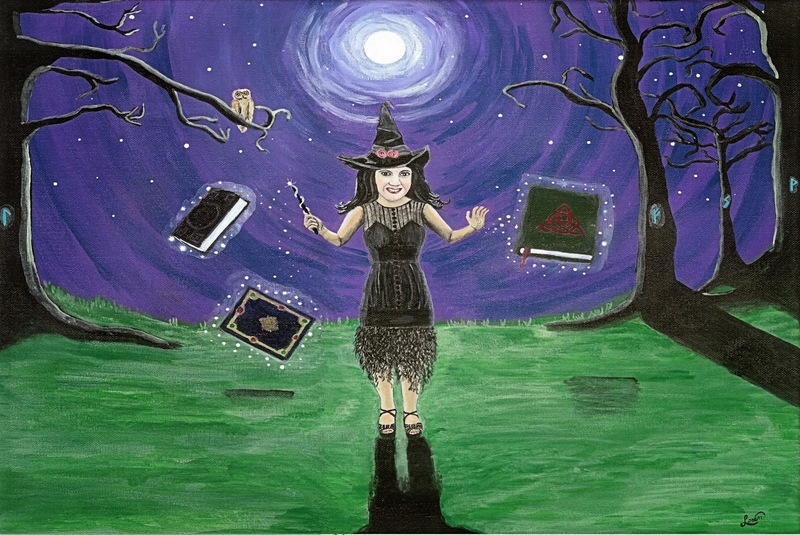 She began creating beautiful, leather bound grimoires in wonderful colors, with beautiful artwork. She made gorgeous designs on the covers and filled them with all of the magic that she knew. After she made each one she took it out in the light of the full moon to fill it with the power of the glowing orb. Soon word spread about the witch's books and more and more people came to obtain the magical tomes. They knew the power that was held within each of the books' pages. The Witch was so happy that she could spread her knowledge even further and help even more people! She made more and more beautiful books and lived magically ever after." Today, I'll be working in my gardens, getting more herbs harvested and getting a few ready for shipping. I'm also making my son a Lucius Malfoy Death Eater mask AND I'm working on a tarot card set with another dear friend. If you would like to order your own handpainted spirit board you can contact me through Lapulia Studios or my art page on Facebook. Please join me for the Samhain Sirens Samhain celebrations and I will see you next week in the Stew with a Mabon craft for your altar!